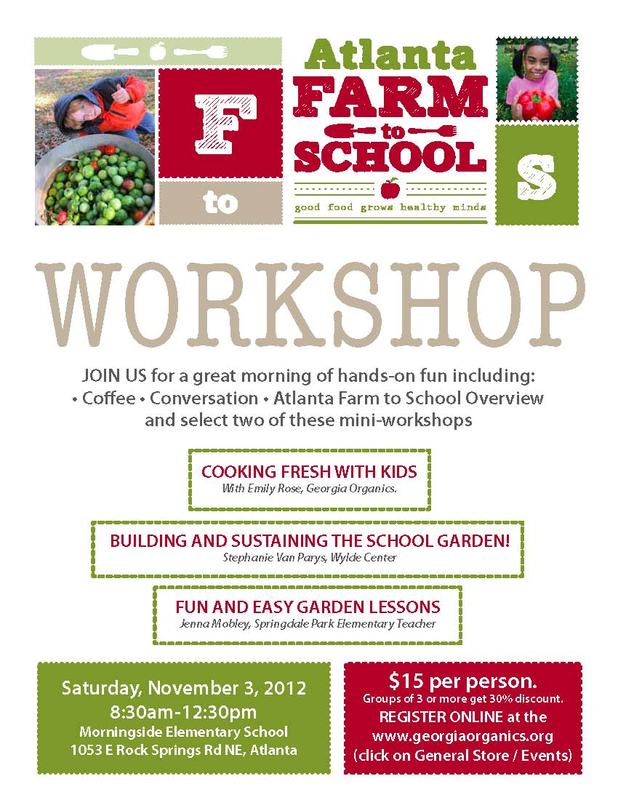 I had a great time presenting at Atlanta Farm to School’s Workshop on Saturday. There was a great group of participants that were eager to learn where to start with teaching standards-based math, science, reading, and writing lessons in the garden. During my workshops, I always like to begin with the basic outline of a lesson. Whether you are teaching toddlers or seniors and whether you are teaching students to do something or to understand something, as a teacher you want to being with modeling the task for the students, then guiding students through the task with support, then allow them the opportunity for independence with the task. I also included a basic supply lesson of essential items to keep on hand – supplies to help with the academic work and supplies to help with the jobs involved with maintaining a garden. Click the link below to view the lesson template and supply list. One of my main goals for teaching through the garden in public schools is to incorporate my lessons into what is already established within the system I’m working with. I consistently link my lessons to the academic standards that students are required to know and are tested on. I also use Accelerated Reader books in my lesson as often as possible because I know that students within my school can take tests on those books and earn points. Depending on the individual school or setting, these integrations may not be as important but it is essential to consider the systems that already exist before incorporating garden lessons. The very obvious way to integrate the garden into the existing curriculum in schools is through science. We glanced over the basic Life Science and Earth Science themes that are covered in the Georgia Performance Standards for Kindergarten – 5th grade. Then we discussed the possibility of teaching school-wide themes at seasonal appropriate times, simply differentiating for each grade level so the lessons continue to build on themselves as students graduate from each grade. You can view the document that outlines the themes and standards by clicking the link below. We also reviewed the Core Domains of Mathematics Education and brainstormed ways to integrate each area into the garden curriculum. As an example, I demonstrated a measurement lesson that I use with Kindergarten, 1st, and 2nd grades. You can view my previous post about this lesson here. I constantly integrate reading and writing into my lessons in the garden. I was eager to share some ideas with the workshop participants. One of the easiest ways to integrate writing into the garden is to keep Nature Journals. My kids write in their Natural Journals after every single class in the garden – sometimes they are able to free-write and other times they are given a specific prompt. To see more information about journaling visit our Curriculum and Resources page. The sample lesson plan I presented at the workshop for Reading and Writing is one that I use with all of the grade levels I teach and all throughout the year. It is a basic lesson on fiction and non-fiction texts and can be used with any topic that the kids are studying at the time. You can see the lesson plan template by clicking the link below. I loved working with the workshop participants to brainstorm ways to integrate gardens into schools. Each setting is very different though and I’d be more than happy to help find a way to make garden education fit – just contact me!